In this tutorial we are going to show you, with step-by-step instructions on how to install Let’s Encrypt with Apache on Ubuntu 16.04. Let’s Encrypt is an open SSL Certificate Authority (CA) that offers free domain-validated (DV) certificates for your websites. SSL Certificates are used to establish a secure encrypted connection between a web server and a user’s web browser. The SSL certificates that have been issued by Let’s Encrypt are valid for 90 days and are trusted by most web browsers today. In order to start with the installation procedure, you need to have Apache or Nginx installed on your server. If there is no web server installed on your virtual server, please follow this tutorial to install Apache. Also, you need a registered domain name with its A record pointing to your server’s IP address. For the purposes of this tutorial, we will use ‘yourdomain.com’. That is it. Let’s Encrypt SSL certificate has been successfully installed on your website. 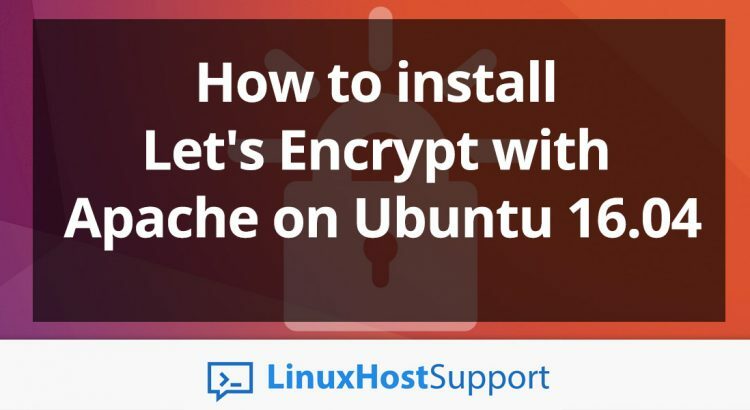 Of course you don’t have to Install Let’s Encrypt with Apache on Ubuntu 16.04, if you use one of our Linux Server Support services, in which case you can simply ask our expert Linux admins to install Let’s Encrypt SSL certificate on Ubuntu 16.04 for you. They are available 24×7 and will take care of your request immediately. PS. If you liked this post on How to Install Let’s Encrypt with Apache on Ubuntu 16, please share it with your friends on the social networks using the buttons on the left or simply leave a reply below. Thanks. I have tried multiple other instructions that did not work, however, this worked perfectly!!! THANK YOU! Thanks a lot as I have tried a lot other options but this steps mentioned is article worked perfect for me..!! Thanks a lot again.! What if I want to enable Let’s encrypt for different ports: 8080 and 8081? Please check your web server configuration. What ports are you using? You have to use DNS challenge rather than http or https validation. I had the same problem and was able to resolve by using DNS challenge.